Does 1 & 1 Equal 2 Here? Does this letter from the Minister’s Office contradict what Burke writes in the agenda papers? What is council’s permit conditions? What is their policy? Does such a document even exist? If it does exist, was this ‘policy’ changed (OR IGNORED) to accommodate the events in question? Would private armed security guards come under Burke’s category of ‘government bodies’? Will Council publish the permit it granted so that residents can finally know the truth? sounds pretty dodgey to me. Burke reckons that security is up to the applicant and here the cops are saying it is council. Go figur! Think you’ve got it wrong Anonymous. 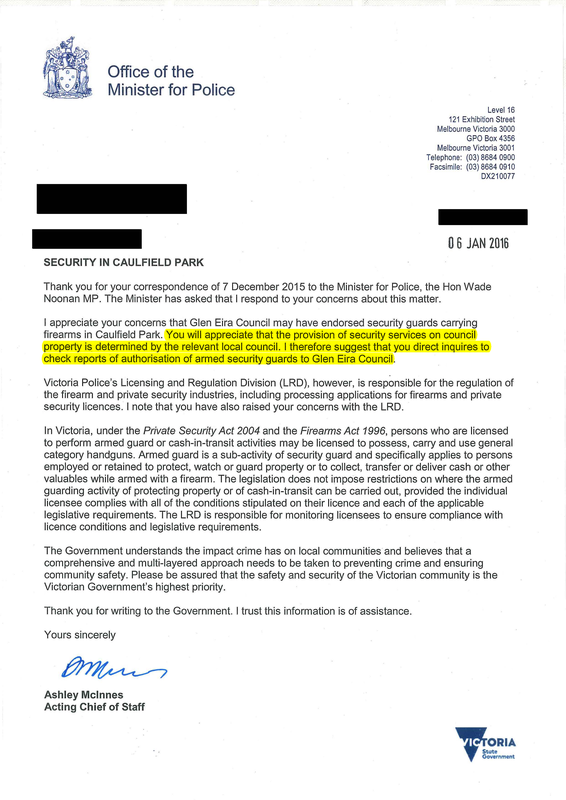 Firstly, given the whole secretive Guns in Parks issue, the fact that the coppers makes a comment that they appreciate Council’s concerns that it “may” have endorsed security guards carrying firearms in Caulfield Park (assuming their quoting from Council provided info) indicates Council’s secretive approval, then as a result of public backlash, secretively rescinded approval for the Jewish Community Security Group to carry firearms in Caulfield Park. Secondly, the explanation of who can carry firearms where and when ie. licensed security guards where ever and when ever protecting property or money indicates that Council’s approval would only be required if Council has a Clause that prohibits carrying firearms in parks. It doesnt. Says a lot about the depth of knowledge the Administration, Councillors and the Jewish Community Security Group doesn’t it. Yee-haw partners law & order has but god-damn-dang-gone from this here little town of By-gone Eria. And we need guns and lots of them, luckily for us poor defenceless scaredy-cats the magnificent 9 have just ridden into town, and our lack of open space will no longer be controlled by bandits and annoying dogs & out-law Frisbee gangs. Jamie The Maccabee Kid, shoots from the hip, and I don’t like strangers in me town.The Tin Star Sheriff, Deal Willing, the Maccabees Kids right hand-maiden, just tell us whare to shoot boss man.Cheap-shot Lipshots, never ever lets you down.Popgun Soundless, not to be trusted with real bullets.Big Jim “Shotgun” Magoo the only party I would joins, is a hunting party for that there rustling MRC mob hiding out at the racecourse.Karina OKCorral, Gun for hire or sale. Maggie Rosstown (almost Oakleigh), guns ain’t my thing, I’m more the knife kinda gal. Wouldn’t the Lone Wolf be the Indian? Seems to me there is nothing in the letter outlining who can carry arms and when and where that is not freely available on the internet or by picking up a phone (which our highly paid officers and elected representatives clearly didn’t do before writing reports and voting). Crap like this happens when everybody in the chain prefers to rely on someone else doing the basics rather than thinking for themselves. Am very glad the Police have sense enough not to buy Glen Eira Council’s ar*e covering exercise and prefer to spend their resources on actually do their job. If only Councillors would do the same!!!!!! No one can say any better than your thoroughly diagonised and directed. This site has been negative towards 2 Councillors by unjustifiably commenting and character assassinating for their own benefit. Council needs to be investigated as before and now much more saying stinking language for obvious reasons. All Anonymous should see and make up their mind before shooting feed back behind their desk. It is unfair to comment on the basis of some says this and bloody that. Let us wake up even if we can be a fly on the wall. If we are concerned we need to see and hear for ourselves. I will be there with couple of friends acting on stage. What a great evening it will be on Tuesday 23 February 2016 at 7.30 ? in the Council building. I’m having trouble parsing this. Is it saying that Council should be making decisions in accordance with the Local Government Act; that decisions should be based on evidence and data; that councillor behaviour should be consistent with their Code of Conduct? Novel concepts for Glen Eira ain’t it. Where is the official government response to the Auditor-General’s report? 18 months and no visible sign of improvment. Worse, DELWP, who the A-G heavily criticized, has been secretly negotiating with the Trustees and MRC to ensure no change does take place. Time for a new Minister since Lisa Neville is so ineffective. Prohibited. It is clearly providing “screen based entertainment or information to the public, in association with the provision of meals or sporting, amusement, entertainment, leisure or retail facilities” on land zoned PPRZ. Unlikely Council will enforce its planning scheme though since the MRC are the miscreant. Expecting council to do anything that might inconvenience the mrc is equivalent to expecting that these councillors will willingly introduce good governance practices. On every step of the way they have assisted in the mrc in its greed. First the c60. Second accepting the amended plans. Third the 4 storey screen. Fifth the cinema. The pox agreement is a laughing stock and so are the councillor trustees who see themselves as representing the mrc and not residents. That is the story in a nutshell of this council. Combined pedestrian and vehicle access to the Centre via the Glen Eira Road Tunnel is subject to a Section 173 agreement between Council and the MRC. The Section 173 agreement, which is a legally binding agreement, outlines the obligations on the MRC to ensure that the Tunnel is maintained for combined pedestrian and vehicle access usage. It isn’t and never has been. And as per normal when it comes to the racecourse, all Council does is wring it hands and say the MRC has no intention of complying with S173 agreement. I suggest we rename the Glen Eira Road Tunnel to “The Oscar Lobo Tunnel” then sit back and watch the legal battle that Council will wage against the MRC. everyone enjoying the rave concert at the racecourse? I wonder if they will be using the same speakers for the cinema? We were in the vicinity last night (Fitzgibbon Crescent – 850 metres away from the course) and the noise was deafening! Under Environment Protection Act s.48AB people can complain to the police about noise from an entertainment venue. I don’t know whether in the circumstances the police would do anything. There is an obligation to comply with State Environment Protection Policy N-2 (Control of Music Noise from Public Premises). Also worth checking whether the operator has a Permit (probably does) and what conditions are on the Permit. S.52-43 in the Planning Scheme is relevant but poorly worded and of course allows the “responsible authority” to waive compliance with requirements.